Design Trends: Energetic, powerful, bold and lucky. Is RED in your future? October 31, 2016 by High Desert Frameworks! 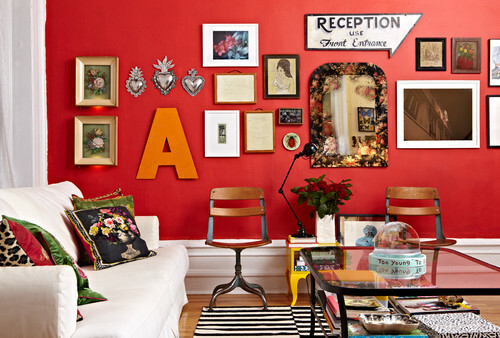 Red makes a bold backdrop for artwork and collections, so it could be a wonderful choice for that gallery wall you’ve been planning. It also works well with the other warm hues (orange and yellow) in social spaces like the living and dining rooms. The farther away you reach on the color wheel — for instance, pairing red with turquoise — the more dramatic and bold the color scheme will feel. In smaller doses, red can bring that perfect pop of color to an all-neutral or black and white design. Whether red or another great color, High Desert Frameworks can assist you with digital printing and custom framing solutions to make that room sparkle! Look us up!